Home Canned Red Salmon by echoforsberg, on Flickr. Note that the canning process mutes the color of salmon, regardless of species. Specifically the distinction between pink and red canned salmons. 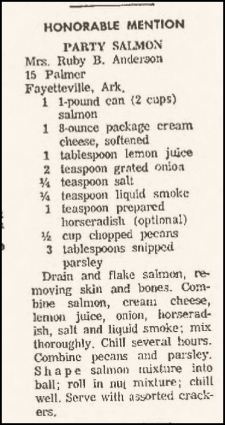 We’ve seen a recipe very similar to this one that called for either pink or red in the recipe for salmon log from Ceres, California. The short version: pink and red are just ways of referring to the two most commonly sold kinds of pacific salmon, sockeye and humpback. Sockeye (oncorhynchus nerka), or red salmon, are often thought to be the most flavorful variety. It accordingly commands a much higher price (even in cans) but when you’re using it in an application where you want something to taste like salmon, it’s probably the best option among canned salmon. You can’t miss the filets in the seafood case–they are bright red, mostly because the sockeye consume krill and other shrimp that contain a compound called astaxanthin, which may improve cholesterol levels. Mature sockeyes average about eight pounds and go up to about 15. Humpback (oncorhynchus gorbuscha), or pink salmon, are the most commonly commercially fished salmon. The nickname attached because the males develop a hump along their spine before spawning. They tend to be around five pounds, topping out at about 12. This hardly captures the gestalt of salmon, because so much in the quality of a salmon depends on when you happen to catch it. Every schoolchild knows that salmon return to the stream to spawn, but it’s not as if the teacher dwells on the biological implications of that fact. What wild salmon species have in common is that they’re born in fresh water; they leave at some point to live in salty water; and at some point later they spawn in fresh water. Let’s put aside for the moment the issue of brackish water and estuaries; take it as an article of faith that this is what the salmon are attempting to do, even when nature hasn’t quite done the plumbing perfectly. They differ, however, in how long they spend in each of these phases, which creates fish with different qualities when you catch them. Salmon sushi by adactio, on Flickr. Two basic issues arise. First, when is salmon safe to eat raw? Well, many of the parasites that are dangerous to humans don’t live in salt water. The longer a species spends in fresh water during its life cycle, the more likely that variety is to carry some kind of bacteria you’d rather not eat. Second is that, when salmon return to spawn, their bodies undergo dramatic changes. The biggest change with culinary implications: the fat content of the fish drops. Sort of inconvenient, given that you can’t eat it raw, so you’re going to have to cook this fish carefully to avoid drying it out. Pink and red canned salmon are both generally wild-caught (some Atlantic canned salmon is farmed, but it won’t be labeled pink or red). Check the label, anyhow. Why use wild-caught fish for canning? The canning process reduces the fat in the in the fish by about half, and farmed salmon tends to be lower in fat, so the product isn’t as good unless you use wild salmon. That said, the canned salmon still has about four times the Omega-3 content of canned tuna. Be aware that canned salmon is, indeed, canned with bones, and sometimes skin, intact. This increases the calcium content substantially if you’re going to eat it with the bones. I’m not going to. I pick through that stuff. If I serve you a bone, it’s going to be ribs or osso buco. Drain and flake salmon, removing skin and bones. 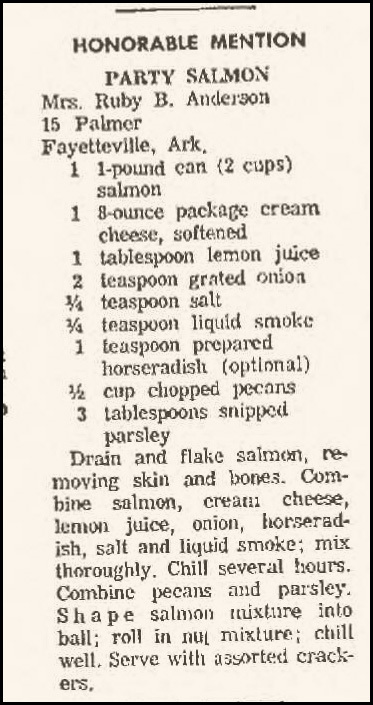 Combine salmon, cream cheese, lemon juice, onion, horseradish, salt and liquid smoke; mix thoroughly. Chill several hours. Combine pecans and parsley. Shape salmon mixture into ball; roll in nut mixture; chill well. Serve with assorted crackers. Mix then shape in a log or small balls and roll in chopped pecans. Chill 6 to 8 hours! Curious about the significance of the word “mandarin?” It’s tricky. This was a VERY interesting read. Who knew?!?! 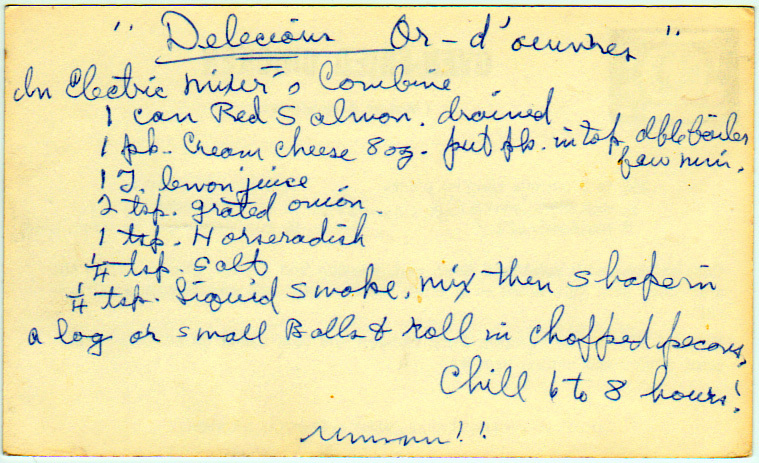 Also, I am surprised that the “Delecious Or d’eourves” actually sound good to me, considering I hate canned salmon.